Blank Slate: Bedroom Art - What should we hang above the bed? We’re introducing a new feature on the blog this week – Blank Slate. Every few weeks, I will ask for your help to finish off a room. We’ll give you the opportunity to chime in and let us know which piece of art, furniture, lighting, or accessory you’d use to finish off the room. Sometimes the rooms will be from my current design projects, and other times I will use an inspirational image. This week, we’re featuring a modern bedroom with a great layout and lovely styling, but it needs something over the bed to complete the look. Which of the items, shown below would you choose to finish this room? Below are four items found on demiryan.com that could add a bit more personality to this bedroom. I provide a few insights as to what makes each piece unique as well as why it works for this bedroom. 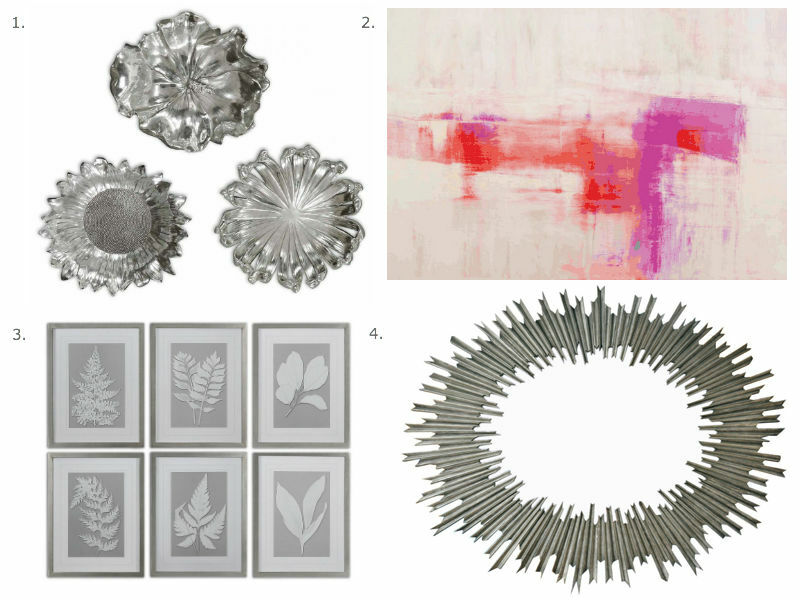 Why it’s unique: Silver plated and accented with a light gray wash, these floral designs can be hung on a wall or used as tabletop accessories. They each have a different organic shape and an inviting shine. Why it works: These designs will soften the hard edges and straight lines in the space and mix up the composition of the room. Their silver shine will make them pop off the wall and become an interesting focal point. Why it’s unique: Artist Carol Benson-Cobb is well-known for creating abstract artwork that evokes a sense of fluidity and emotion. In this piece, she uses a range of color and heavy brushstrokes creating a unique, modern energy. It is a giclee print on stretched canvas. Why it works: This piece is large, horizontal, and full of bright colors. In a modern bedroom, with cool colors (such as grays and whites), the Benson Cobb Glimpse artwork, with warm colors ranging from pink to orange, will make a energetic, positive statement. Why it’s unique: These six leaf prints are accented by double V-grooved, white mats and surrounded by frames with a silver leaf base and champagne wash. Each piece is unique and displays a different kind of leaf shape. Why it works: Keeping with the color palette, these six leaf prints will complement the existing furnishings and wall color in the space but add a softness that room is missing. 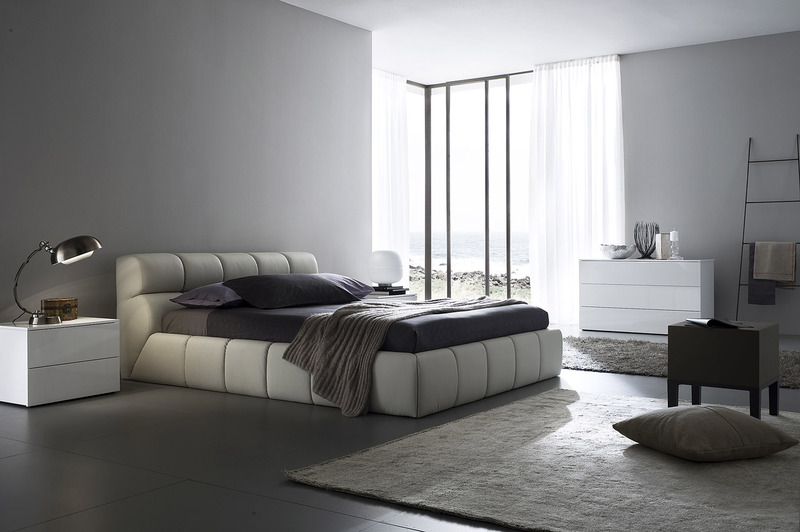 Natural elements in a room create a calming environment. Why it’s unique: Edgy with texture and striking in style, the oval Rory mirror has a hand-carved hardwood frame with an antiqued silver finish. Oly Studio is known for their award-winning designs that infuse antique motifs with a contemporary edge. This mirror is a perfect example of that style combination. Why it works: Adding a mirror to any room will make the space feel bigger and brighter. A mirror’s reflection will display an ever-changing piece of artwork. The oval shape of the Rory Mirror will soften the rooms modern, hard edges. It will be like a piece of jewelry adorning the walls above the bed. Which one do you think should be hung over the bed? Would one of these work for your space as well? Comment below and share you thoughts!